Just by bought one of these from ebay for $25. I hear they were not very popular due to the non-breathable polyester material that was used. I think they are just plain weird looking. This is an ebay pic so it is hazy...better pics when in hand. GD was a short lived order of dress, but it spawned a whole issue of insignia. The GD pattern trade patches were in the hands of collectors before they were fully on issue! As you said, not a popular uniform, but an interesting period of dress in the CF. The worst part of that uniform was the garrison boots which were extra tall smooth leather boots that were to be highly polished just the same as parade boots. Besides that they were not particularly comfortable. 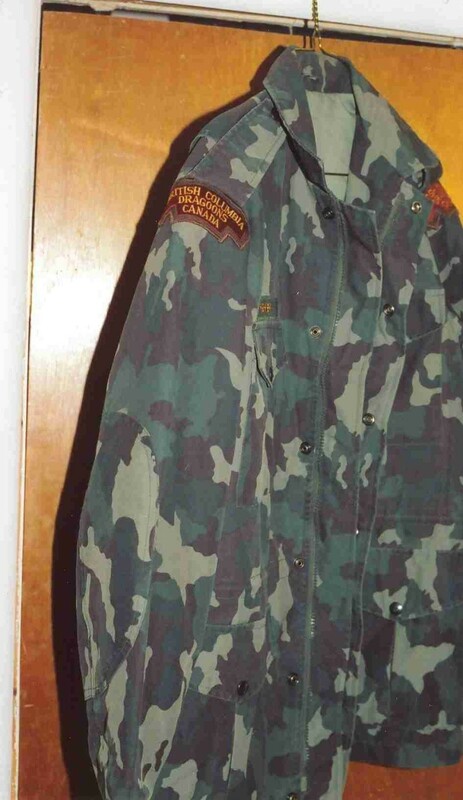 The funny thing is we still wore green combats at the time when in the field and camouflage when in garrison... anybody else see something backwards with that thinking? 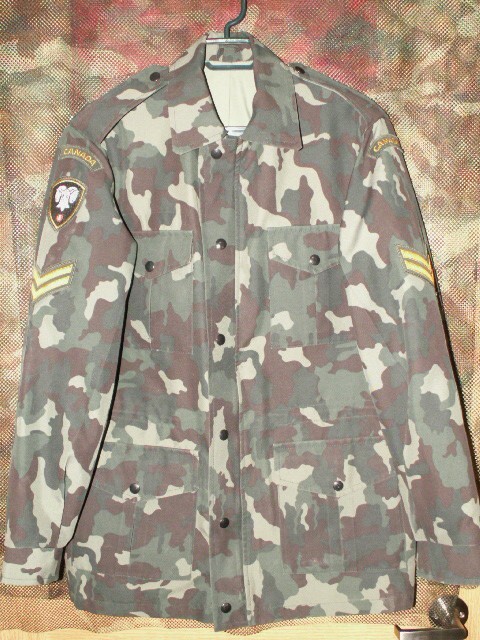 Well after looking about on my laptop for a while, I finally found a photo, not a good one, of my Garrison Jacket. 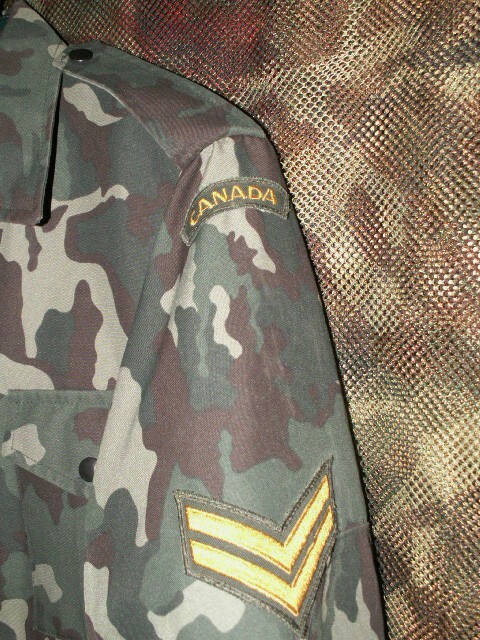 This example is badged to the British Columbia Dragoons. Unfortunately, this is the only photo of my example. Surprising I don't have a cleaner photo of the shoulder patch or the inside label. Here's mine. If you look close there are faint marks where the Presidential Unit Citations were removed when I was posted from the 2nd battalion to the 3rd. Turns out that I never wore garrison dress again after arriving at the 3rd so I'm looking for a pair of PUC's to put back on as that is how the jacket was badged when last worn. 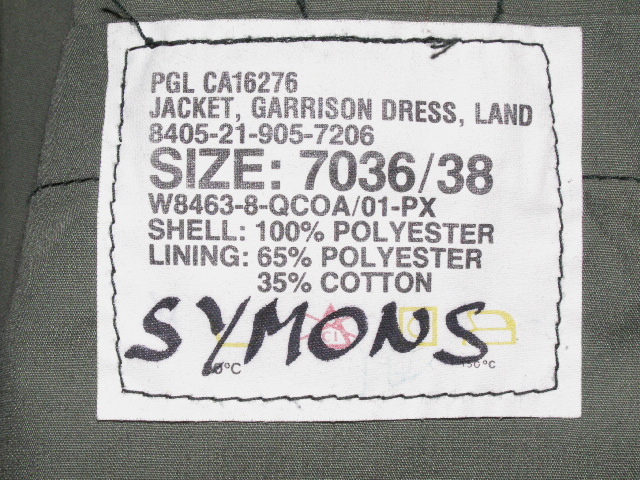 Hi Steve, The PUC's are the fully embroidered ones? They were the same style as those worn on the DEU and short sleeve shirts as seen on the tan tunic in this photo. Incidentally, the tan uniform was abolished at basically the same time as the garrison dress. Thanks Steve, Those are the fully embroidered pattern. Okay, now I know. I wasn't familiar with that term. I only know of the metal and cloth pin on version (US issue? ), the embroidered version and another version with a gold wire border and embroidered center. There is a melton type pattern for wear on the battledress, and the fully embroidered type are a more recent (albeit 20 years or so in use now) pattern. 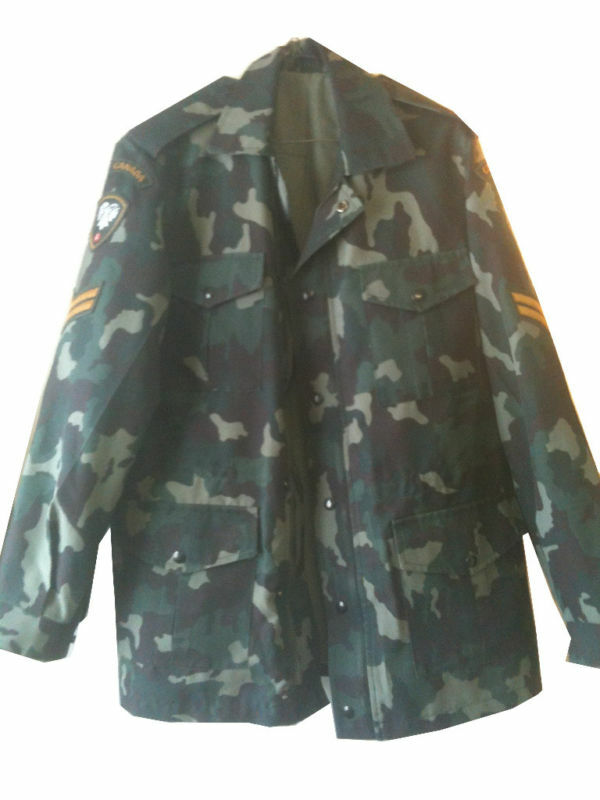 The battle dress version is essentially the same as the "fully embroidered" version that I have shown except that it is embroidered on a khaki background instead of black. Sorry Steve, I didn't explain myself well. You are correct, with the melton background material for the earlier pattern. Finally got mine in the mail today...in nice condition too. I'm afraid my pics are not much better than the ebay pics. 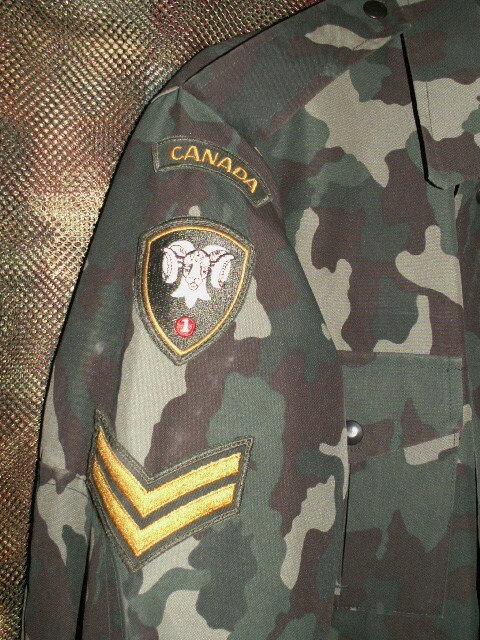 Nice Garrison Jacket, funny thing when they came out Canadian Tire had the same camo for sale in the hunting section, interesting to see no unit shoulder flashes or trade badges. The GD black dress belts and buckles are still worn by some units.